[133 Pages Report] MarketsandMarkets forecasts the global capacity management market to grow from USD 524.4 Million to USD 1,557.9 Million by 2023, at a Compound Annual Growth Rate (CAGR) of 21.1% during the forecast period. The forecast period has been considered from 2018 to 2023, whereas 2017 is considered as the base year for estimating the market study. The main objective of this report is to define, describe, and forecast the capacity management market on the basis of segments that include components (solutions and services), deployment types, organization size, verticals, and regions. The report provides a detailed information regarding the major factors influencing the growth of the market (drivers, restraints, opportunities, and industry-specific challenges). This report forecasts the market size with respect to 5 main regions, namely, North America, Europe, Asia Pacific (APAC), Middle East and Africa (MEA), and Latin America. The report strategically profiles key players and comprehensively analyzes their core competencies. This report also tracks and analyzes competitive developments, such as mergers and acquisitions, new product developments, and Research and Development (R&D) activities, in the capacity management market. The capacity management ecosystem comprises capacity management service and solution providers, such as IBM (US), BMC Software (US), CA Technologies (US), NetApp (US), Riverbed Technology (US), HPE (US), TEOCO (US), VMware (US), Sumerian (Scotland), Syncsort (US), TeamQuest (US), Nlyte Software (US), CPT Global (Australia), Neubrain (US), Axway (US), IDERA (US), SolarWinds Worldwide (US), Turbonomic (US), Aspire Technology (Ireland), ASG Technologies (US), ManageEngine- IT division of Zoho Corp (US), Planview (US), and HelpSystems (US). The capacity management market is expected to grow from USD 597.5 Million in 2018 to USD 1,557.9 Million by 2023, at a Compound Annual Growth Rate (CAGR) of 21.1%. Several factors such as identifying underused resources, need for increasing efficiency by better use of existing and future resource and manage IT resource demand according to business priorities are driving the market. Verticals such as Information and Technology (IT), telecom, healthcare and life sciences, and Banking and Financial Institutions (BFSI) have contributed largely to the market. The capacity management market is segmented by component, deployment type, organization size, vertical, and region. The solutions segment is estimated to dominate the market in 2018, while capacity management services are expected to witness the fastest growth during the forecast period. Capacity management solutions are gaining popularity as it empowers enterprises to match the growing demand of IT infrastructure for meeting business requirement in timely and cost- effective manner. The cloud-based capacity management solutions deployment is likely to gain traction during the forecast period and grow at highest CAGR as it offers agility of on-demand resource deployment and consumption. This deployment mode is being preferred by organizations as it offers ease of access along with reduced capital and operational expenses. The Small and Medium-sized Enterprises (SMEs) segment is expected to grow at the higher CAGR in the capacity market during the forecast period. The rapid deployment of capacity management solutions by SMEs to maximize investments on infrastructure is one of the major reasons expected to drive the capacity management market growth for SMEs. However, increasing awareness and digital transformation has also influenced SMEs to adopt cloud-based capacity management solutions. Capacity management solutions and services are being increasingly adopted by verticals, such as telecom, IT, healthcare and life science, manufacturing, BFSI, retail, hospitality, government and public, and others (including education, oil and gas and energy and utilities), to optimize the IT resource allocation and utilization for increasing the RoI and productivity thus, fueling the growth of the capacity mangement market across the globe. The IT vertical is expected to hold the largest market size during the forecast period. However, BFSI vertical is expected to represent prospective opportunities during the forecast period for capacity managementvendors. 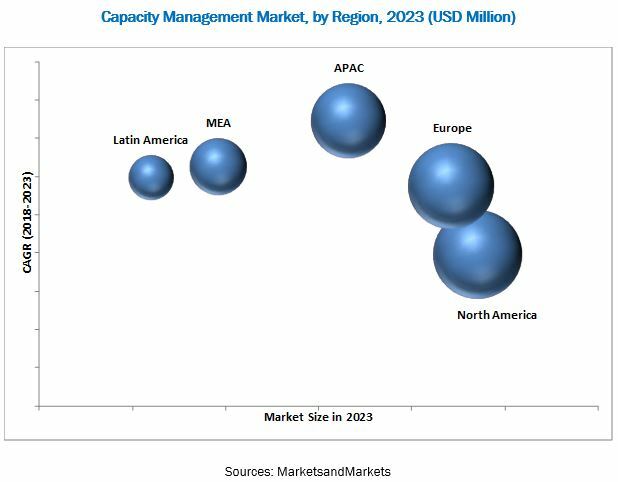 The capacity management market has been segmented by region into North America, Europe, Asia Pacific (APAC), Middle East and Africa (MEA), and Latin America to provide a region-specific analysis in the report. North America is expected to have the largest market size and is expected to dominate the market from 2018 to 2023, considering the presence of large capacity management vendors in the region. The region is also considered to be one of the most advanced regions with regards to the technology adoption and IT infrastructure optimization. Following the evolution in ICT arena, organizations have adopted and integrated new technologies into their existing IT infrastructure. The integration of legacy systems with new technologies have further increased the complexities in IT infrastructures. Effective capacity planning for such complex IT infrastructure is quite difficult. Hence, this is one of the major identified restraints affecting the widespread adoption of capacity management in the global market along with the challenge of inefficient gathering of data from the enterprise’s scattered infrastructure, owing to the deficits in the infrastructure. Such deficits make it difficult to gather the required data for analyzing and predicting capacity utilization and management. The benefits offered by effective capacity planning such as better management of demand planning, increasing visibility and on-time service delivery is expected to provide great opportunities to the in fueling the growth in adoption of capacity management solution in the future. The major vendors that offer capacity management solutions and services across the globe are IBM Corporation (US), BMC Software, Inc. (US), CA Technologies (US), NetApp (US), Riverbed Technology (US), HPE (US), TEOCO Corporation (US), VMware, Inc (US), Sumerian (Scotland), Syncsort (US), TeamQuest Corporation (US), Nlyte Software (US), CPT Global (Australia), Neubrain, LLC. (Neubrain), Axway (US), IDERA, Inc. (US), SolarWinds Worldwide, LLC. (US), Turbonomic, Inc. (US), Aspire Technology (Ireland), ASG Technologies (US), ManageEngine, IT division of Zoho Corp (US), Planview, Inc. (US), and HelpSystems (US). 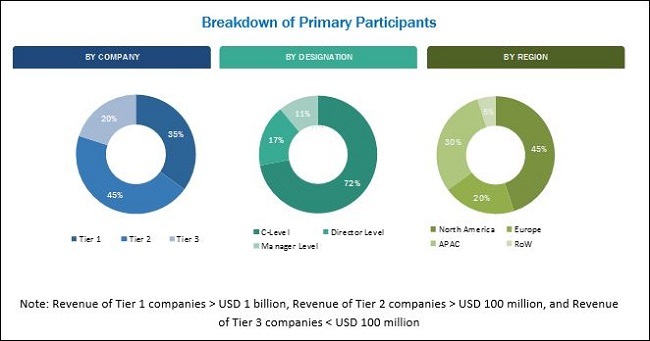 These vendors have adopted different types of organic and inorganic growth strategies, such as new product launches, partnerships and collaborations, and mergers and acquisitions to expand their offerings in the capacity management market. *Details on Business Overview, Products and Solutions/Services Offered, Recent Developments, SWOT Analysis, and MnM View might not be captured in case of unlisted companies.